Sometimes it pays to keep old stuff in the car. You never know when you'll need it. Longtime Hidden New Jersey readers know that we count on a few key reference materials during and after our forays into the field. Ivan's got his birding manuals, and my bible, of sorts, is the WPA Guide to 1930s New Jersey. You know there's potential for a good story if you locate something that was listed in a travel guide more than 70 years ago. That's especially true in Northwestern New Jersey, where a lot of stuff is still where it was back then. We were counting on that when we stopped near Andover-Aeroflex Airport the other day to get our bearings. While Ivan did some light birding, I checked the WPA Guide for the next destination. Bingo. I found "the Lackawanna RR Cutoff, 110 feet high and stretching for three miles across Pequest Valley. 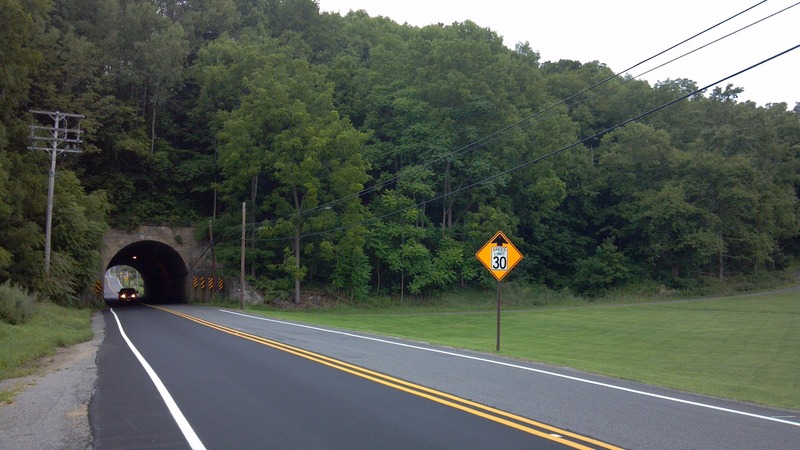 Built just prior to the World War, it helped to reduce the main line distance by 11 miles." That, I was pretty sure, referred to a portion of the Paulinskill Viaduct, a well-known but well-hidden engineering marvel of its day. With soaring arches supporting the rail line between Hoboken and Scranton, it was, at its construction in 1911, the largest structure built using cast concrete. It hasn't supported train traffic since 1984, but it's gained a fan base among urban explorers. And, well, it's historic. I'd been there before, but Ivan hadn't, so it was worth a look. The thing is massive, and it comes out of nowhere, like a mirage in the woods. My recollection was that it was just off one of the north-south roads north of Route 80, but I couldn't remember if it was 206 (which we were on) or 94. We decided to find out. The Guide said there was something there, so what the heck. Be sure to click on this photo for the full story. I have to admit that my favorite part of the whole story is where the school got buried during construction and the kids cheered. The sign confirmed what the Guide had told us, but it indicated nothing about the viaduct. It wasn't easy to see where the cutoff headed, or where the track had been, because the whole embankment was overgrown. there'd ever been a train line atop that embankment. Like a bloodhound hot on the trail, Ivan was focused on getting to the Viaduct, come hell or high water. I would have been content to let it go, but he was a man on a mission. Figuring I'd try to help somehow, I remembered the one document in the car that might help: his 1976 Bicentennial New Jersey roadmap. Surely it would show rail routes on it. Even if they weren't precise, the markings would give us an idea of where to go. 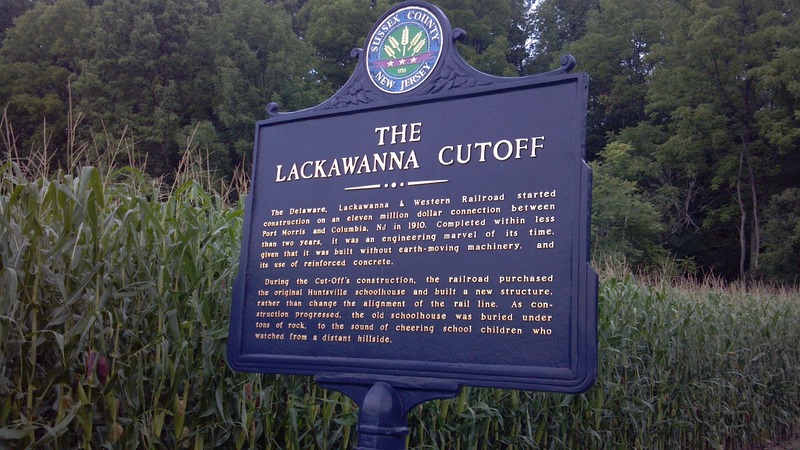 Yes, indeed, the map showed the route of the Lackawanna Railroad, so yes, I had to apologize for all of the times I've made jokes about keeping 35 year-old maps in the car. The map also made me realize the best thing might be to get additional help from something a little more modern: my smartphone. A few taps later, and the ugly truth came out: the viaduct is off of Route 94 outside of Knowlton, just a few miles north of Route 80. Mea culpa. I relayed the unfortunate news and we headed along back roads to get there. After reaching 94, we drove a bit until I saw a familiar-looking one-lane bridge off the northbound side. "There it is," I exclaimed. The bridge takes you to a narrow road and through the woods until... there it is, towering high above. Now, summer isn't really the best time to see the viaduct, hidden as it is among the trees. My last trip had been during springtime, and even then the foliage obscured the full majesty of the thing. Still, though, you have to admit it's pretty amazing, sitting out there like Brigadoon in the mist. According to some sources, New Jersey Transit plans to use the Viaduct for passenger travel between Hoboken and Scranton, starting as early as 2014. For now, though, the structure is the dominion of urban explorers and graffiti artists. 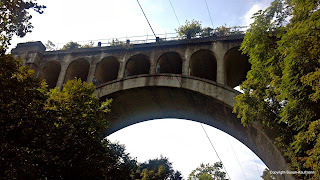 After we found the viaduct, I couldn't help but wonder why it wasn't mentioned in the WPA Guide. The reinforced concrete arches are infinitely more impressive than the big berm that crushed the schoolhouse outside of Andover, so what gives? A little bit of research revealed what's probably the answer: 94 didn't exist yet. According to Wikipedia, that state highway wasn't commissioned until the 1950s, well after the Guide was published. Perhaps the arches weren't as easy to find as they are now (and I say that with tongue planted firmly in cheek), simply because the road wasn't built yet. It's really kind of a shame. I'd think that the New Jersey explorers of the 30s and 40s would have enjoyed seeing it as much as we did, and even more with a train on top! Unfazed by Shark Week? Give Heron Week a try.